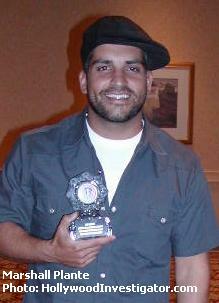 [HollywoodInvestigator.com] Winners of the 2005 Tabloid Witch Awards -- sponsored by the Hollywood Investigator! 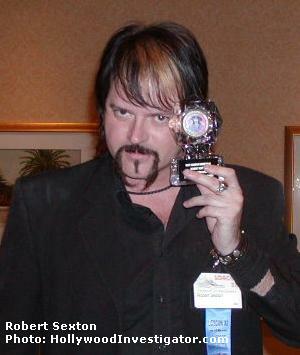 -- convened at the Loscon 32 science fantasy convention on November 26 to screen their horror films -- and collect their trophies! During the Q&A following the screenings, filmmaker Robert Sexton told the audience that is he now raising money for a feature-length version of Legion: The Word Made Flesh.-- which won Tabloid Witches for Best Horror Short Film, Best Supporting Actress, and Best Visuals. A seasoned director of commercials and music videos, Sexton financed Legion in the time-tested manner of independent filmmakers -- credit cards -- leaving him in debt. While cryptic about Legion's budget, Sexton allowed that $25,000 was not far off the mark. Now that Legion has proven itself on the festival circuit, Sexton hopes to find other investors -- or a studio -- to finance its feature-length version. Legion is the tale of an enigmatic ex-priest who assists a desperate mother seeking a cure for her possessed daughter. They meet many charlatan shamans and witches and crackpots promising a cure, but have difficulty finding the "real thing." Noteworthy for its moody, beautifully haunting visuals, evoking supernatural horror films such as Lost Souls, The Ring, and Gothika, Legion won the Tabloid Witch Award for Best Visuals, shared by its DP Bobby Eras and colorist Marshall Plante. Legion also benefits from a gripping performance by Italian actress Sabrina Bertaccini, who portrays a gypsy con artist performing a phony cure for the possessed daughter. 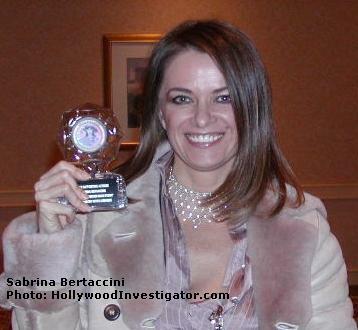 Upon seeing her Tabloid Witch Award for Best Supporting Actress, Bertaccini exclaimed, "It's so cute!" Bertaccini told the audience that the reason she acts is because she "has no choice" and that her life would be easier if she could ever wake up without her driving passion to act. 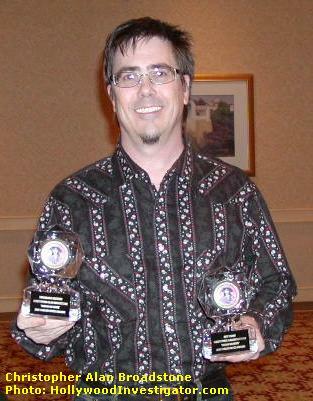 Also present at the awards ceremony was filmmaker and author Christopher Alan Broadstone, who collected two Tabloid Witches, one for Best Sound and one for Honorable Mention, for Human No More. A former musician, Human No More is Broadstone's third self-financed horror short film. "Nobody took me seriously as a filmmaker until I made some films," Broadstone told the audience, explaining why he turned to self-financing his shorts. 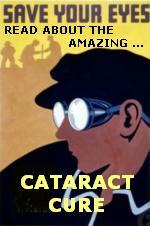 He is currently developing a feature film -- that has interest from outside investors! Human No More is about a hard-boiled police detective who, after the murder of his wife and son, loses faith in God, Satan, and humanity. Rejecting all three, he takes a dark and surprising plunge into the occult. An audience member said he'd liked to have seen what happens to the detective after he embarks on his path. Broadstone agreed that Human No More has sequel potential. 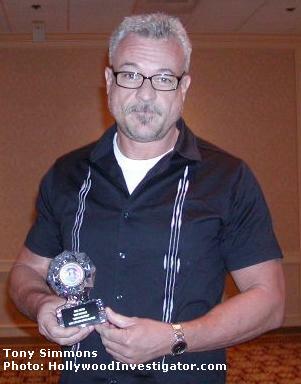 While soft-spoken and self-effacing during the Q&A, Tony Simmons portrayed a grim and gritty detective on screen, earning him the Tabloid Witch Award for Best Actor. 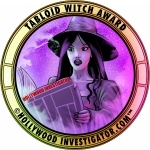 While all seven Tabloid Witch Award-winning films were screened at Loscon 32, some of the winning filmmakers and actors could not attend the Los Angeles event as they were working on projects either in New York or Japan. Their trophies will be sent to them over the next month. After the screenings, the Loscon audience was invited to vote for their favorite of the seven films. In a surprising three-way tie, Legion, Mole, and SuperStore shared the honor for "Audience Choice." Human No More ranked fourth behind them, but ahead of the other three films. This was a surprisingly strong showing for SuperStore, which had won only one Tabloid Witch Award -- for Honorable Mention. Filmmaker Jennifer Soemantri was unable to attend Loscon, but received her Honorable Mention on December 8, 2005. She continues to make short horror films -- but is also in talks with a manager about directing her first feature project. If you haven't already read about our 2005 winning films -- read about them now! Read about the New York winners.